Overview: The story of the Indian space programme is described in 17 chapters, 600+ pages, 140+ illustrations, 8 appendices, 20+ tables and 1000+ endnotes. “India has always collaborated with USSR/Russia, USA, France and Israel” May 2018 edition of IndiaSe – a magazine for global Indians. Download pdf of review. 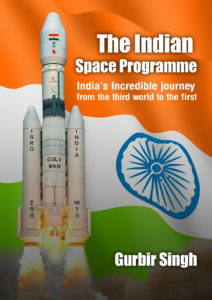 “a significant addition to the existing body of literature on the Indian Space Program“. Book Review of The Indian Space Programme in the Jan-Mar 2018 issue of Indian Defence Review. Download pdf of review. “The book describes the evolution of India’s activities in space in the context of Indian and global scientific and technological evolution. Reading the book is like walking down a broad avenue and exploring interesting side streets that appear from time to time” https://www.geospatialworld.net/magazine/ (page 66). Download pdf of review. “A true scholarly, and authoritative history. A landmark book.” Dr Allan Chapman, Wadham College University of Oxford. “Singh has done a masterful job of pulling together unique material and photos for a popular reader.” Leonard David. “Excellent book giving each and every single detail, not only about India’s Space Programme, but also historical aspects of Europe, USA and Russian” Dr Rajinder Singh, University of Oldenburg, Germany. Paperback available on Amazon.co.uk, Amazon.de, Amazon.fr, Amazon.it, and Amazon.es. At 18:25 on 21st November 1963, a rocket launched into space from India. It heralded the start of the Indian Space program even though the news of this achievement was lost in the midst of the global media coverage of the assassination of President Kennedy on the following day. Since those early days when a former Catholic church was the space programs headquarters and just about everything the Space program used came from abroad, India is now a leading spacefaring nation. An overview of the contents below.